We all know that F. W. Goudy did some weird stuff, but how did this make it all the way through (and into print)? 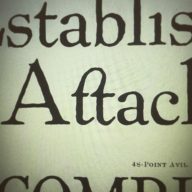 They don’t make tt ligatures like this anymore From the Anvil Series by the Inland Type Foundry, catalog 1907. The @EkTypeFoundry specimen is glowing The @EkTypeFoundry specimen is glowing in the weird #kdy light. See all posts, categories, & tags here!